You won’t find a more interesting, rewarding and fun group experience this side of Mt. Everest. Our Group Packages are designed for your organization, offering options to fit your budget and create memories for months and years to come. Available for adults and kids 5 to 95. No experience necessary! Got a scout troop, church organization, or school group? Looking for something different for your next office party? This package is our most popular, designed for those looking for an easy way to experience the excitement of rock climbing. Just bring in your group, we’ll take care of the rest! 2 Hours of Climbing at one of our Premier Indoor Climbing Centers. Expert PRG staff to work the safety ropes for your group. Free Harness Rental for each participant. **Advanced booking required. Call today! Have a Large Group of 75 or more participants? We Offer Large Group Discounts – contact Astra Wallace for details. Build trust and confidence, share a unique experience, and learn a new skill! 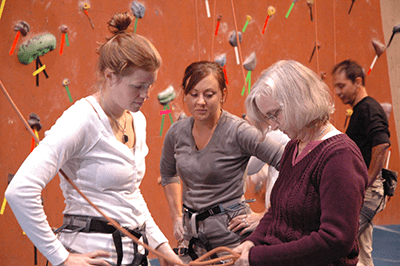 The Intro to Climbing Package is based on our introductory course for new climbers. Participants learn the essential safety and movement skills to start climbing. In addition, they learn to work together and trust their fellow students. Must be 16 years or older. 1 Hour Intro Lesson for the entire group. Expert PRG staff to help work the safety ropes for your group! Free Equipment Rental for each participant.